Are you wondering why I am talking about a pumpkin recipe in summer? Well, pumpkin is a “super food” and it’s great to incorporate into your meals year-round! 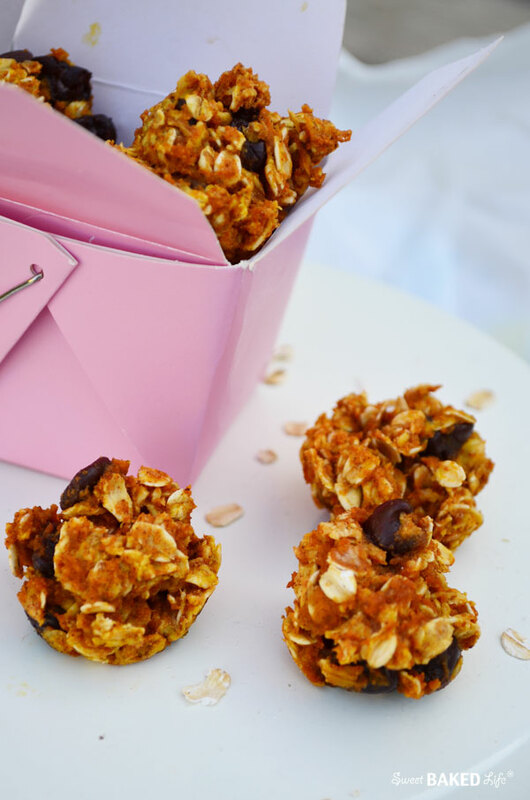 So if you need of breakfast on-the-go, you’ve got to try these quick and easy Pumpkin Oat Breakfast Bites. 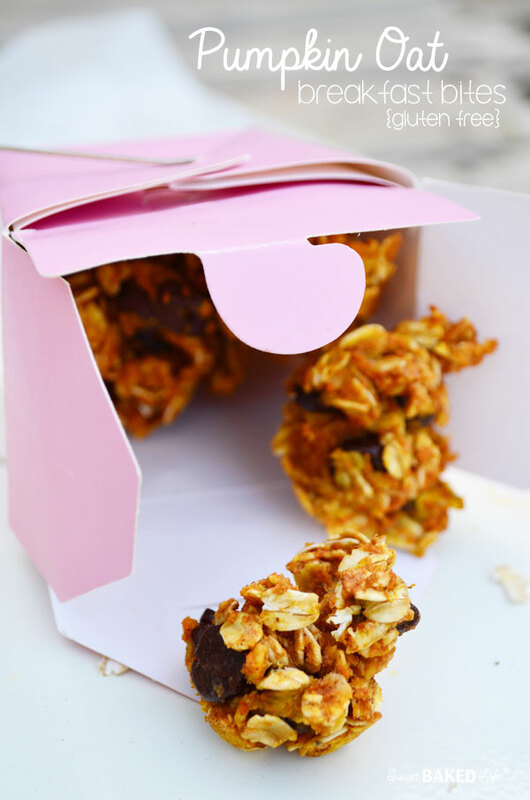 These tiny and tasty morsels have just the right amount of sweetness, fiber and protein to keep you satisfied all morning, and they’re gluten-free! I am always looking for breakfast recipes that I can make on Sunday and take with me to work during the week. Breakfast always seems to be the hardest meal for me to prepare during the week, so if I plan ahead I am so much better off. Do you feel the same? As well, pumpkin has all sorts of nutritional value, so I thought I would give these little gens a try. And they are actually quite good. The nutty oats and smooth pumpkin along with the spices and a hit of chocolate really is a nice combination of flavors. Now mind you, my family would not eat these. But that’s ok with me! Heat your oven to 350 degrees. Spray mini muffin tins (I used 4 tins with 12 openings each) with non-stick coconut oil cooking spray and set aside. In a large bowl add the pumpkin, egg and vanilla and whisk until smooth. In a medium bowl add the dry ingredients and mix until combined. Then add the dry ingredients to the wet ingredients nd gently mix until combined. With a 1-inch cookie scoop, place the dough into the muffin tins. Bake for 15-20 minutes, until golden brown. Cool on a wire rack before popping into your mouth! *Note, to make these truly gluten-free, be sure to use gluten-free oats and chocolate chips. One cup of canned pumpkin has seven grams of fiber and three grams of protein. Canned pumpkin is packed with vitamins and provides over 50 percent of the daily value of vitamin K, which may reduce the risk for some types of cancer. Pumpkin is loaded with nutrients that will help your heart, bones, eyes, and skin. Includes beta-carotene which is an antioxidant that helps rejuvenate skin, protect your vision, and may even reduce risk of arthritis. Includes Potassium which is a mineral involved in lowering blood pressure and maintaining healthy bones. 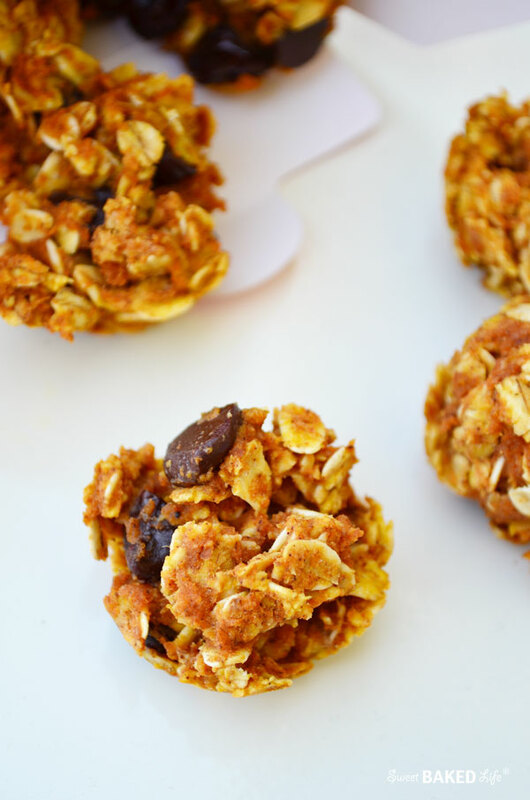 Here’s to a great, healthy week of eating these gluten-free Pumpkin Oat Breakfast Bites! Enjoy! Thanks Mom! Lovin’ pumpkin even in the summer!! Sheila, I’m the same way – I’ll bake and prep on Sunday so that I have snacks ‘n lunch to eat throughout the week. I’ve been making a lot of granola lately so this would be a welcome change. And ain’t nothin’ wrong with pumpkin year round! I always have cans of pumpkin puree in my pantry. I can’t wait to try this! Pinned. Oh my gosh. Right up my alley! Pinning and trying for sure! Thanks!